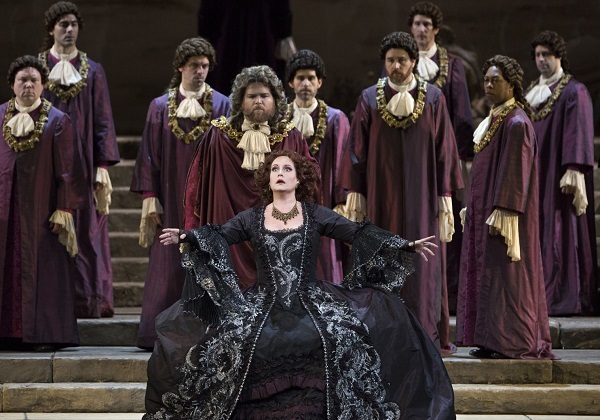 I had the opportunity to see the live broadcast of the Met's Idomeneo. I've been to a couple Met operas broadcast into a regular theatre, but this is the first time they had reserved seating and a little coffee/snack bar. The gentleman next to me (I was on the end) has season seats and we chatted a bit. It turned out that he couldn't read the subtitles and didn't know the story. So between scenes I tried to give him a brief summary of what just happened. It worked pretty well, but in the third act it became clear that he didn't realize Idamante was a trouser role (a role written for a woman to play as a man). He kept asking who the "white-haired woman was" and thought I misunderstood when I told him it was Idomeneo's son Idamante. He began asking things during the scenes, and people started shushing him. Honestly, I felt he was less irritating than the folks with their snack wrappers. All in all, I think I enjoyed the opera a little more with him there. He was a very nice man and helped to while away the intermissions. I'll have to be sure to say 'hello' to him at the next one. As for the performance: with the exception of one actor/character, I really enjoyed everyone's performance. The opera itself is a bit odd though, it felt disjoint in a few places, as if scenes were missing. The characters also seemed to have a disjoint variety of personalities... Elettra being severe and jealous, but playing it as kooky as well. Most everyone else was serious, fitting a tragic opera. And then, there was Idamante. I couldn't get a good feel for the actor that played him. I felt the voice wasn't right, and their facial expressions kept putting me off. They didn't do bad technically, but I just couldn't connect with them. All in all, the opera was about a 3/5 for me. I enjoyed the experience and like that I got to add another notch to my Mozart belt, but I probably wouldn't jump at a chance to go again. The opera is set in Crete, about 1200 BC. Helen, the wife of King Menelaus of Greece, was carried off by Paris, son of King Priam of Troy, triggering the Trojan War. Kings Idomeneus (Idomeneo in the opera) of Crete fought in the war, and is returning after having been away for many years. 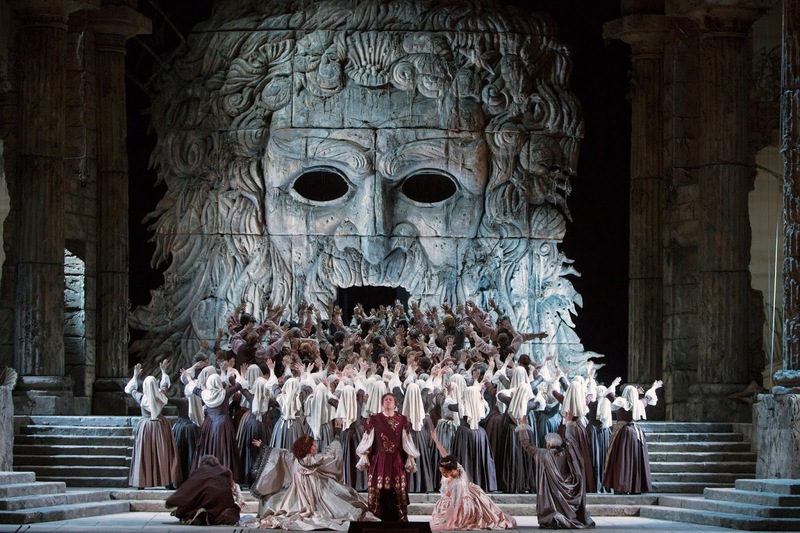 Idomeneo has sent ahead of him some Trojan captives, including Priam’s daughter, the princess Ilia. On her arrival in Crete she is rescued from a storm by Idomeneo’s young son, Idamante, who has ruled as regent in his father’s absence. Feelings of love have developed between the two. When Idomeneo's fleet is caught in a storm, he vows, in hopes of being saved, to sacrifice to Neptune the first man he comes across on land. That man turns out to be Idamante. Idomeneo, obviously, doesn't want to sacrifice his son. He tries to distance himself from him, causing Idamante to think he's angered his father somehow, leading to much internal angst to all. 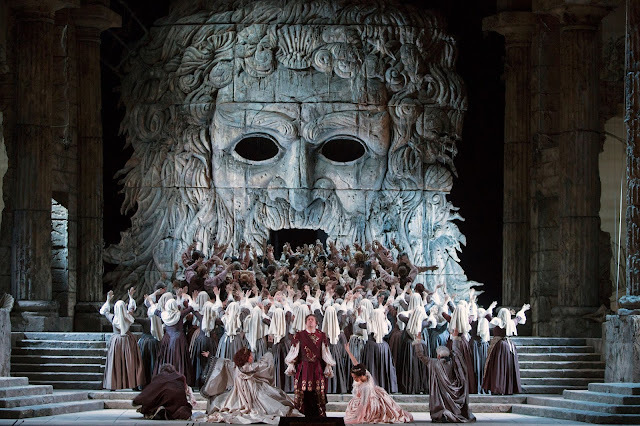 Finally, Neptune begins to punish Idomeneo's land and people for the lack of sacrifice, and the temple elders demand it. In homage to Abraham and Isaac, Idomeneo moves to slaughter his son, whom is willing to sacrifice himself, and Neptune stays the slaying. 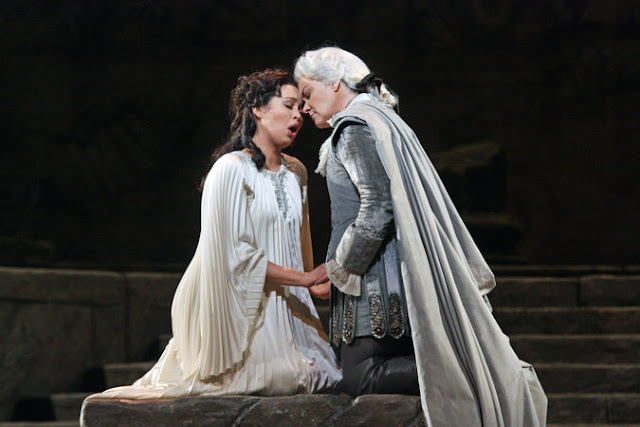 The god says he will be satisfied with Idomeneo stepping down as king, crowning Idamante, and betrothing Ilia to him. (Mostly) all is well! All but poor Elettra. Having been previously first in line for Idamante's hand, she's been jealous and near mad the whole opera. Hearing Neptune's decree, she loses it, thrashing and finally collapsing. Elza van den Heever as maddened Elettra. I saw her first as Mary in Mary Stuarta!